Project Art Designed through Emotions (ADE) is the result of the COMMIT / SWELL Brainwave project. Within the Brainwave project a mobile application (running on a tablet) had been developed, collecting and transferring data from multiple sensors (EEG, ECG, EDA) measuring brain activity, heart rate, and Galvanic skin response to a system. Within this system all collected data were analysed by algorithms that indicated individual emotions on a scale of valence and arousal. In order to measure and visualise group emotions, we had to scale up our original platform by a factor of 10. Different hardware had to be considered to allow the platform to be used with 20 people at the same time. The time between measurement and output had to be reduced to real-time, producing results in a matter of seconds. This project required algorithms that were able to calculate the emotions of a small crowd. Each person was connected to one node. The collected individual data of these nodes were then send to a group analyser node. We achieved this by distributing the workload over several processing nodes, making optimal use of modern multi-core processors. In short, we improved the platform, algorithms, and software to be able to cope with groups of users simultaneously. This method of processing can be easily scaled up to a large network of computers. We created real-time processing of data enabling direct feedback and we used algorithms to calculate crowd emotions based on individual physiological measurement data. Our aim was to create a unique experience measuring and presenting the group emotions of people. 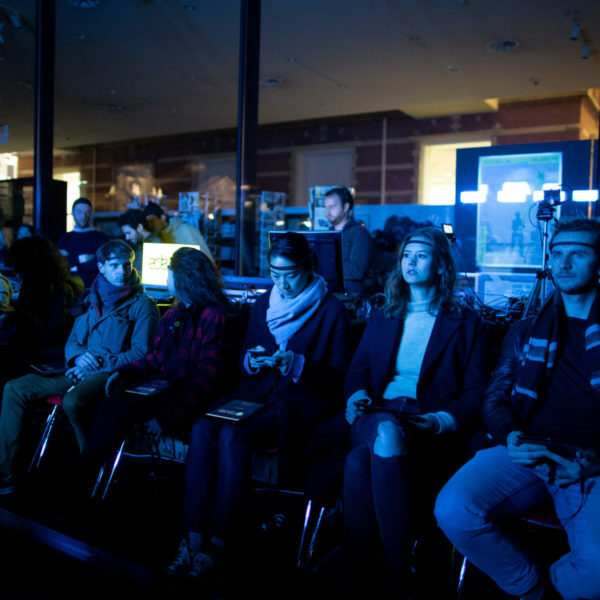 Emotions of a large group of 20 people were measured and provided real-time feedback. This took place during Polaris: the opening act of the Amsterdam Dance Event 2016 and during the Frankfurter Buchmesse 2016, were Arnon Grunberg read this book “Het Bestand”. 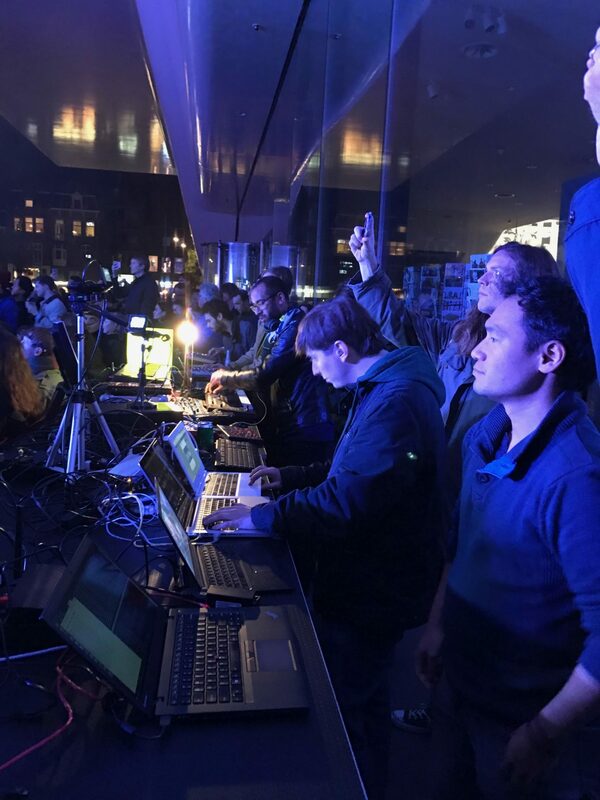 During the Amsterdam Dance Event, our mobile application collected data from 20 people simultaneously, while listening specifically for this event composed music and watching a light show. 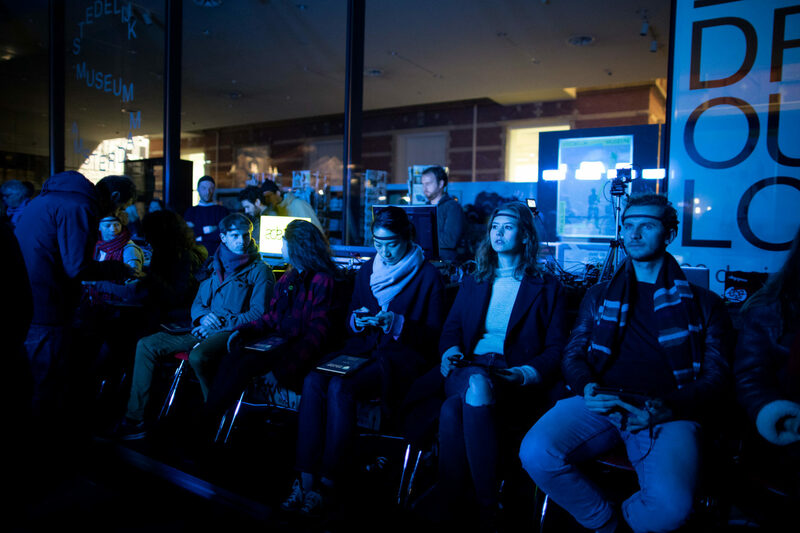 Meanwhile sensors for brain (EEG Muse headsets, sponsored by Muse), heart (ECG, sponsored by Wahoo Ticker) and skin conductance (EDA, sponsored by eSense) measured their emotions in real-time. The data were transferred to a server running on a laptop, where the crowd emotions were calculated. 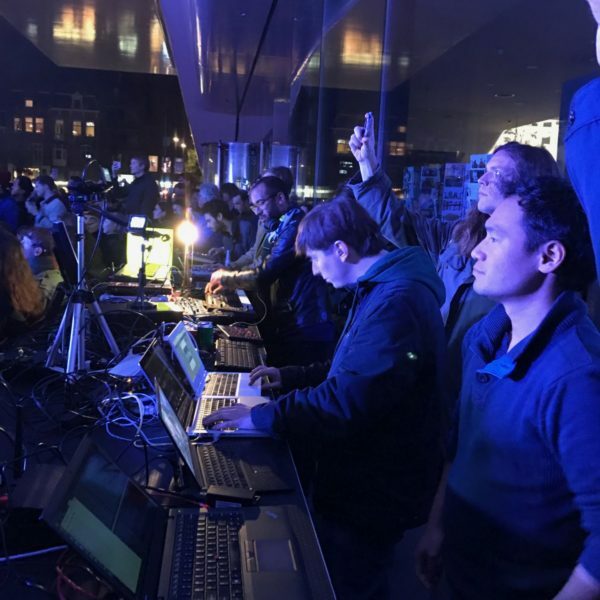 The emotions were translated into a MIDI signal, which triggered a light installation and music in real-time, so that artists and audience co-created the piece together, Polaris. 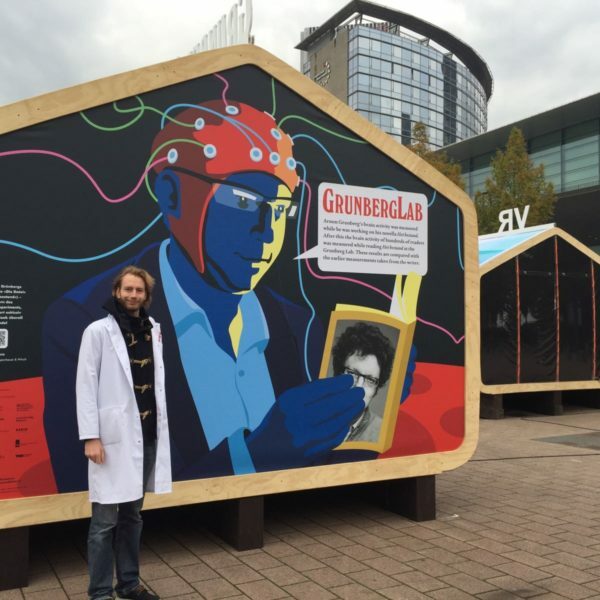 At the Frankfurter Buchmesse, an audience of 20 people was selected and brought together in an isolated room, the Grunberg Lab. The same setup and platform was used as during the Amsterdam Dance Event. The audience was connected likewise and listened to Arnon Grunberg, who was reading “ Het Bestand”. Brain activity was monitored and levels of the emotions of happiness, enthusiasm, relaxation, anger, sadness and compassion were measured. These data will be examined by TNO for scientific purposes. 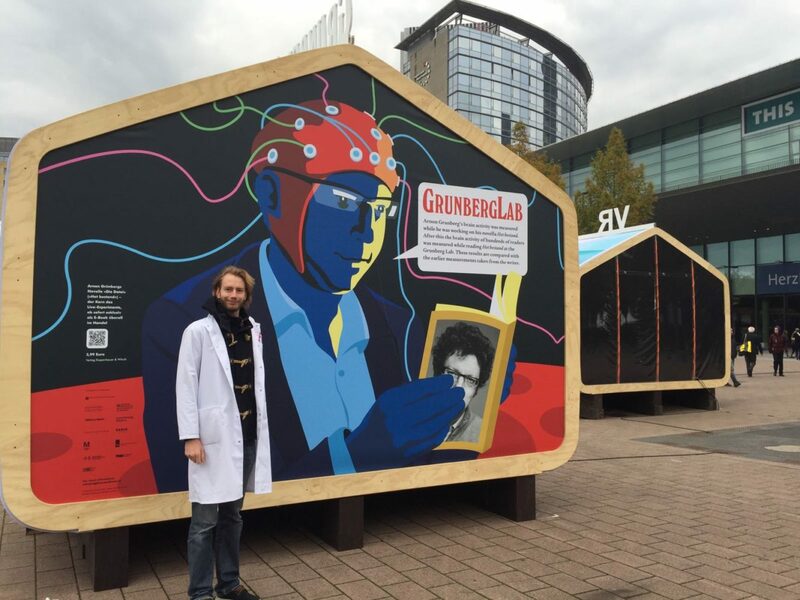 ADE, Art Designed through Emotions, is a new project that resulted from the COMMIT/ SWELL project (well-being at work) and the Brainwave project (measurement of human emotions while reading the book of Arnon Grunberg).